Dominion Energy employees recognized for top innovations and solutions that benefit customers and the environment. RICHMOND, Va., Oct. 3, 2018 /PRNewswire/ -- A mobile app solution to enhance collaboration with customers won top recognition at Dominion Energy's inaugural Innovation Expo. The app uses augmented reality to communicate with customers one-on-one before overhead power lines are converted to underground power lines on their property. An employee-led team from the Power Delivery business unit and the Information Technology group won the "Chairman's Excellence Award" at a ceremony held today at the Science Museum of Virginia. 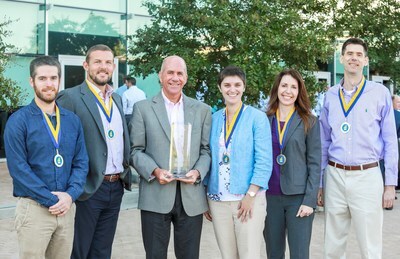 CEO Thomas F. Farrell presented the honors to that team, as well as 11 other finalists voted among the best by their colleagues across the company. The awards, which recognize the most creative ideas to emerge from employees in the past year, make up just one part of the company's much broader innovation strategy that is moving forward. "Our customers want choices and improvements in how to power their homes, businesses and vehicles," Farrell said. "They want their energy company to be a leader in modernizing electric and natural gas infrastructure, and developing clean energy solutions." The mobile app that won the highest honor was developed by employees Andy Thomas, Alison Kaufmann, Adam Flowers, Annette Martin and Nathan Worcester. Currently being used in the company's Strategic Underground Program, the app enables an employee to use an iPad camera to add a virtual image of equipment that is overlaid on a customer's property configuration. The employee can review the layout with the customer and adjust it until the customer is satisfied with the placement. It is another way to partner and collaborate with customers when installing equipment on their property. "We are not simply trying to react to customer expectations, we are creating new experiences," Farrell added. "The achievements of these colleagues and those to come will ensure our future success."